History comes alive at the 12th Annual Yankees in Falmouth! And Some Confederates Too! Walk back in time and experience Falmouth the way it was 150 years ago during the Civil War! Come out and meet Union and Confederate soldiers and see their camps! President Lincoln will also be at this year’s event and be available for a photo-op! Other event activities include: Encampments, artillery and cannon firing demonstrations, Strict Military Impressions, Civil War lectures, non-combative reenacting, and much more. The event will be on the grounds of the Moncure Conway House, built in 1807 and recognized as part of the Underground Railroad. A few notes from the organizers: First, we will look to the weather with a little more pessimism this year. The rain hasn’t let off significantly since last year, and if by August , the ground is still saturated, and if we are still getting large amounts of rainfall, we will most likely cancel. Last year, Saturday was tolerable…but Sunday, things got very very wet, and some folks lost gear to water damage. Secondly, Stafford County has changed their business rules, and now require all events to apply for a grant for county tourism financial support. Because of these changes, things that Stafford County traditionally provided for in planning and financial support may no longer be available. Without some additional planning support, I’m not sure if we will still be able to have YiF this year. Third, because of before mentioned Stafford Counties policy changes, we do not know how much support, if any, YiF will receive from Stafford until sometime around July. This means at worst cancelation, at best everything is the same, somewhere in the middle may mean loss of some creature comforts. The political climate has taken its toll recently on our passion for Civil War history, and now I believe it has caught up to our beloved event. We will do our best to keep this event alive, and ask for your support in patience, and your time in planning support, if you can provide it. History comes alive at the 12th Annual Yankees in Falmouth! And Some Confederates Too! Walk back in time and experience Falmouth the way it was 150 years ago during the Civil War! Come out and meet Union and Confederate soldiers and see their camps! President Lincoln will also be at this year’s event and be available for a photo-op! 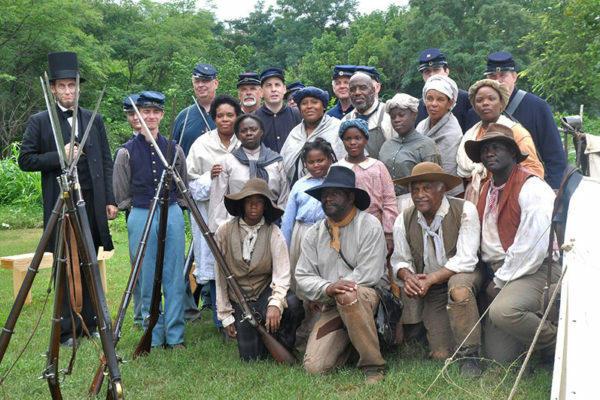 Other event activities include: Encampments, artillery and cannon firing demonstrations, Strict Military Impressions, Civil War lectures, non-combative reenacting, and much more. The event will be on the grounds of the Moncure Conway House, built in 1807 and recognized as part of the Underground Railroad. First, we will look to the weather with a little more pessimism this year. The rain hasn’t let off significantly since last year, and if by August , the ground is still saturated, and if we are still getting large amounts of rainfall, we will most likely cancel. Last year, Saturday was tolerable…but Sunday, things got very very wet, and some folks lost gear to water damage. Secondly, Stafford County has changed their business rules, and now require all events to apply for a grant for county tourism financial support. Because of these changes, things that Stafford County traditionally provided for in planning and financial support may no longer be available. Without some additional planning support, I’m not sure if we will still be able to have YiF this year. Third, because of before mentioned Stafford Counties policy changes, we do not know how much support, if any, YiF will receive from Stafford until sometime around July. This means at worst cancelation, at best everything is the same, somewhere in the middle may mean loss of some creature comforts. The political climate has taken its toll recently on our passion for Civil War history, and now I believe it has caught up to our beloved event. We will do our best to keep this event alive, and ask for your support in patience, and your time in planning support, if you can provide it.